3.0 (based on 3 ratings) Thanks for your rating! Product #638 | SKU BEMX400 | 3.0 (based on 3 ratings) Thanks for your rating! 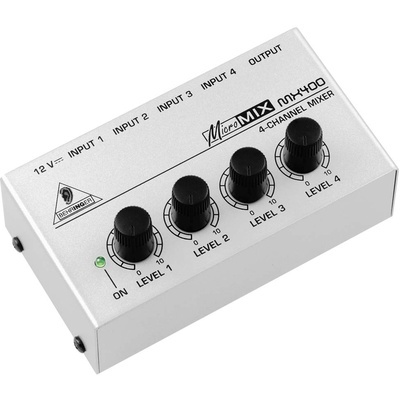 Despite its ultra-compact size, this 4-channel line mixer is big on features! It yields the highest sonic quality at all output levels, boasting ultra low-noise 4580 operational amplifiers for outstanding audio performance—the same op amps found in its much bigger brethren. Expanding on the capabilities of standard-size mixers is where the MX400 does extremely well, for example as a sub-mixer. If you are running short on available channels on your “big” mixer and need to bring the output of three different keyboards into your mix, you can simply connect them to the MX400, work out the keyboard mix, and connect the MX400’s output to a single input on your main mixer. It will catch your eye because it’s cute as a button, but you’ll want to own one because of what it can do for your performance. Enables lots of instrument changes without having to go to the desk each time, and with the volume control on each input, eliminates all that horrible pop and crack. Altogether great value.